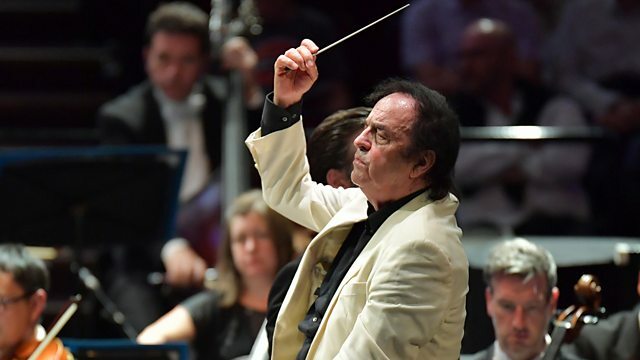 Live from the Royal Albert Hall, the Royal Philharmonic Orchestra conducted by Charles Dutoit. Dvorak: Cello Concerto (soloist: Alban Gerhardt). Bartok: Duke Bluebeard's Castle. Live at BBC Proms: Royal Philharmonic Orchestra conducted by Charles Dutoit, with Alban Gerhardt (cello). Dvorak's Cello Concerto and Bartok's opera Duke Bluebeard's Castle. Martin Handley discusses the story behind the richly scored music of Duke Bluebeard's Castle with musicologists Heather Wiebe and Rachel Beckles Willson. The gothic horror story of Duke Bluebeard prompted some of the most imaginative, descriptive and shocking music Bartók would write. With its huge orchestra, underpinned in this concert performance by the mighty Royal Albert Hall organ, Bartók's score speaks of the darkness of Bluebeard's vast castle and the cold-blooded murder of his six wives. Under Principal Conductor Charles Dutoit, the Royal Philharmonic Orchestra conjures up Bartók's unsettling realm after Dvorák's Cello Concerto, which the composer believed 'outstrips the other two concertos of mine'. Martin Handley hosts a discussion with musicologists Heather Wiebe and Rachel Beckles Willson about the story behind the richly scored music of Duke Bluebeard's Castle, and about the life and work of its Hungarian composer. Recorded earlier at Imperial College Union. Performer: Alban Gerhardt. Orchestra: Royal Philharmonic Orchestra. Conductor: Charles Dutoit. Performer: Ildikó Komlósi. Performer: John Relyea. Orchestra: Royal Philharmonic Orchestra. Performer: Charles Dutoit.